One high school student speaks his mind about this issue, and he tells it to the TEA’s face. How much is it really helping students? The STAAR writing prompt is passed out on the day of the test, saying something like “Write a persuasive essay describing your stance on whether one person can change the world.” The students stare and stare at the prompt, but they can’t formulate something even remotely resembling an opinion. They don’t care about whether one person can change the world. It’s not something they think about on the average day. This prompt is kicking their butts. Wait, no. It’s not the prompt. It’s the essay and the emphasis that’s put on it. Since the third grade, classes write essays for standardized testing. It wouldn’t be much of a problem if the teachers didn’t put WAY too much emphasis on it. They spend way too much time teaching kids how to format and organize it and find “specific examples” and make them write practice essays as if the real one wasn’t bad enough. All of this formatting and example-using results in dull, boring essays that make the STAAR essay seem like the Borg from Star Trek: The Next Generation: out to take whatever individuality these students have and crush it into a million tiny pieces. The worst part is that they also want them to include their “unique writer’s voices.” I bet they don’t know that some of their voices are brutally honest and sarcastic (“My counter-argument is too short, you say? Well, I was going for a more ‘drop the mic’ approach”). So here’s the game plan: A STAAR essay requires an intro AND a specific example AND a counter-argument AND a conclusion AND unique writing voice. That’s an awful lot to fit in a 26-line box. That’s another thing: the 26-line box. That’s nowhere near enough room to write everything. To some teachers, “more effective” almost always translates to “longer”, which is really counterintuitive considering the provided writing space. With the room kids are given, they should be letting those “drop the mic” counter-arguments slide. Without more room, students will worry about running over and finishing on the last line. The solution? A full front and back page for writing. The STAAR essay is hurting the English class curriculum; that’s what it all boils down to. The time English teachers waste teaching students how to write these could be spent doing what they’re paid to do: teach the English language. Here’s some advice for everyone: juniors and seniors, be glad you never have to do this again. Freshmen and sophomores, brace yourselves. 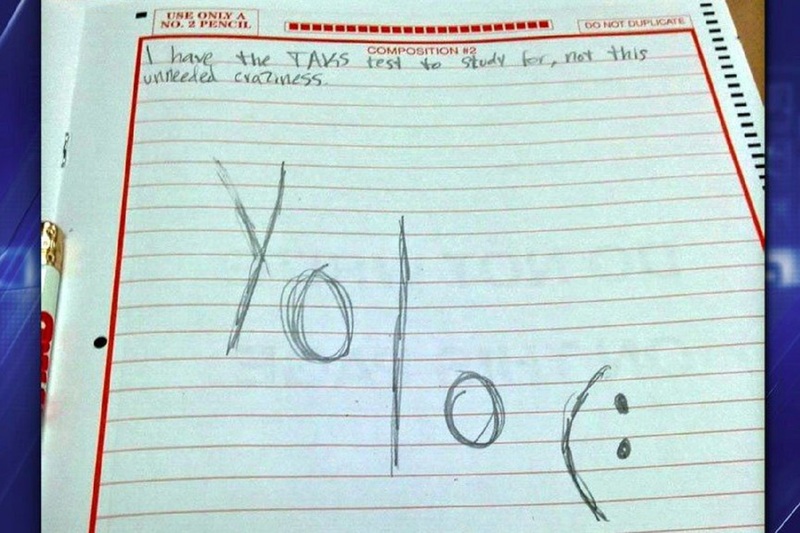 Teachers, COOL YOUR JETS, and STAAR graders, expect essays on the caliber of the brave kid who wrote “yolo” big enough to cover the whole paper, and when you get it, pass it on to the people who make these blasted tests. Students shouldn’t have to suffer through this essay anymore.